I mean really? Just look at this little guy! Adorbs! Now to the subtitle of this post… I’ve never claimed to be an expert on chickens. That’s what this blog is about, right? Me learning as I go and you, my small but encouraging audience, following along with me. 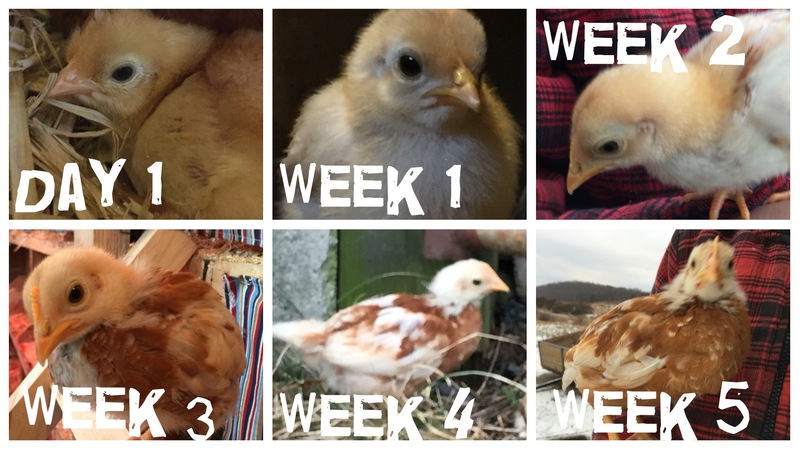 Most of what I’ve learned has been gleaned from other blogs, Backyard Chickens, and a really awesome Facebook Group I found… and a LOT of observing my own chickens, trial and error. A lot of trial and error. 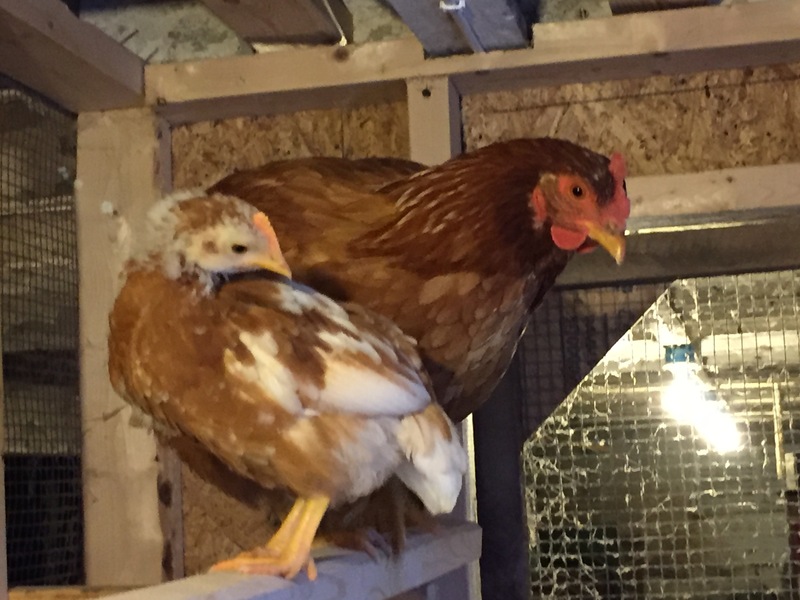 This adventure of Broody Abby and her Baby Chick has challenged pretty much everything I ‘thought I knew’ about raising chicks. It really, really has. When we first brought the sexlinks home from Tractor Supply in their box, I had no clue what I was doing. I had a brooder box and brooder lamp my father had used to raise pheasants a few years prior, a feeder, a waterer, and a lot questions. I answered them by buying a couple of chicken raising guides and jumping online to suppliment. I followed the guidelines I found in those sources to the letter. My chickens had a brooder lamp until 6 weeks (7. really because I read they needed it until the last of their baby fuzz was gone an couple of the chicks still had baby fuzz on their heads until 7 weeks). I didn’t let them outside until almost ten weeks, except for short, supervised visits in which I sat with them and watched them freak out over every little sound, the blowing of the wind, other birds flying over head. I followed the feeding chart on the back of their feed bags for an idea of what to feed them at what age. And when we added the Rhode Island Reds, I kept them separated and integrated them once I thought the RIRs were big enough to hold their own against the sexlinks who were 3-weeks older but lightyears bigger than them. And then there is Abby with Pip. Abby is a first time mother, too, but unlike me, she isn’t following anyone’s rules or guidelines but her own. Pip had never seen a brooder box or a brooder lamp. He sleeps cozy. nestled under her wings. I expected her to keep him there for a couple of days, but from he very beginning, she always encouraged him to come out and eat, and after the first week, she encouraged him to go outside and play and explore. In his first 5 weeks, Pip has gone outside almost every day, learned to scratch in the ground for food and bugs, and when he gets cold, they go back into the coop, and he snuggles under her wings for maximum warmth. He has chick starter, yes, I keep his dish stocked… but he also eats the bugs, slugs, seeds and stuff Abby has been teaching to dig up when they go outside. He also eats the scratch and seeds, oatmeal, scrambled eggs, fruit, etc I feed the others as treats. Why? Because Abby eats it, and if she decided it’s good for him, she buck-buck-bucks until he tries it. He isn’t separated from the rest of the flock. He lives with them, and now, at 5 weeks, is not afraid to move among them. They haven’t been aggressive or harmful to him. They seem to tolerate him just fine, in fact. It is, in short, NOTHING, like raising day-old chicks in a brooder. It is NOTHING like getting my sexlinks and RiRs to co-habitate without killing each other. And also, NOTHING a book or a website could prepare me for… because it was natural. A hen and her chick doing what instinct tells them. Granted, the harder parts are yet to come. Pip is entering his tween-stage, and in a few weeks, he will become an adolescent rooster. There may still be scrimmages between him and Dots. I hope not, because for now, he seems to know his place in the flock. But time will tell… and because of Abby’s poor timing in going broody right before winter, all of this will come to pass in the dead of winter when they are confined to coop (mostly of their own choice because they don’t like to have cold toes) and close quarters. It could get interesting in my coop in the next couple of months, people. But what I take away from the last 5 weeks is that this is how I want to raise my chicks… with a momma to sit with them, teach them and protect them. Abby has been amazing with Pip. If she goes broody again, I will definitely give her eggs to sit on! This is such a nice story! We’ve been contemplating letting our broody ladies sit on some eggs this spring. And as always, new trials and errors are so stressful! Good to have an example of letting nature do it’s job! Good luck Pip! Thank you! I highly recommend letting your hens raise their own babies. I took a very hands-off approach and didn’t even candle the eggs until after the first one had already hatched (and I did it wrong, turns out, so it doesn’t matter that I did candle). I was nerve-racked because of the time of year she went broody (late fall), worrying the eggs would get cold when she got up to eat but it turns out I was worrying for nothing. I have no separate space for broody hens so I kept Abby with the rest of the flock. It has caused no problems, really. They left her alone while she sat and now that Pip has hatched, he has integrated seamlessly into the flock. Abby protects him and when he was smaller, discouraged any other hens from so much as walking near him. She’s lightened up the last couple of weeks as he gets bigger. He’s getting more independent of her now. I think the only aspect I would change if there is a next time is I would give her more than two eggs. I should have given her 5-6. Enough so Pip could have friends his own age. I read once that a single hen can sit up to 15 eggs under without compromising the chicks hatch rate. I’m sure Pip would have loved some friends! We’ll have to give a try this spring! I wasn’t ready for 15 chicks, and I’d never dine this before so I just let Abby have 2 eggs. One of them turned out not to be fertile. It would have been nice if it had been a chick instead. Good luck in the spring! There is something satisfying and good about watching a mother hen and her chick. :-)? Lol! My coop was built inside my parents dairy barn. It hasn’t been used for anything except storage in a lot of years. Cobwebs mean bugs to eat, right?